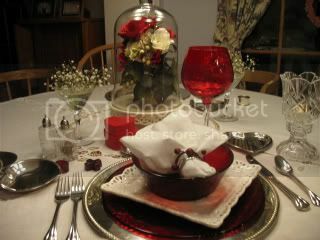 So I thought I would post some pics from Valentine's 2008 when I wasn't a Bloggin'Betty! So what are your plans for Valentine's Day this year?? Very pretty table, Betty! 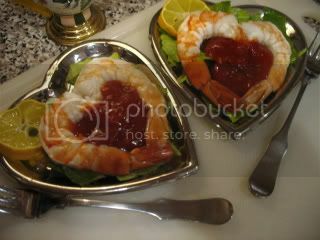 I remember the shrimps! and the cakes! I like revisiting! Great idea! Before you were Bloggin Betty? Too cute! Yumm...everything looks beautiful and delicious!! Kathleen, I've been revisiting the past too! I love how you do up the holidays and I remember those shrimp! Well, I remember it all, but the shrimp are too cute! Not certain of our plans, but we've mentioned filet and champagne. Sounds good to me! We'll be home. I don't like going to a restaurant on holidays. Too crowded and the service suffers, I think. Seems like several of us are living in the past lol. I remember the shrimp! 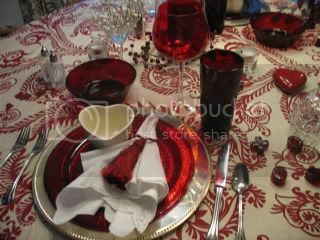 But I don't remember that beautiful red and white table cloth. You always set such a beautiful table Kathleen. We don't have any plans. My parents might be coming into town if they can get a flight out. They fly space available (my brother is a pilot) so it's not always easy. Even I remember the shrimp !!! 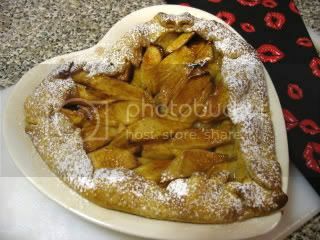 Always love your tables... the apple tart looks very very yummy!! My plans..Brad is supposed to be steppin out on Angelina - so I'll wait to see if he shows up!!! The new dishes are beaux too! I hope you plan on doing a curtain call this Vday.. Trips down Memory Lane are so nice too sometimes. You do have the BEST table settings,Kathleen! Bloggin' Betty ... isn't that the name you son came up with? ... What a hoot! I remember all the pictures. Hearts everywhere ... I love them all but the shrimp are my favorite. So clever, yet simple. No big Valentine's Day plans here ... We'll see Addi and Tate. John and I will go out shopping together to each buy our own gifts. Oh, I loved the reminder about those shrimp appy's! Everything you do has such style, it must be like eating in a fancy resto every night. Kathleen, you are the queen of tablesettings, and I do fondly remember this from last year. 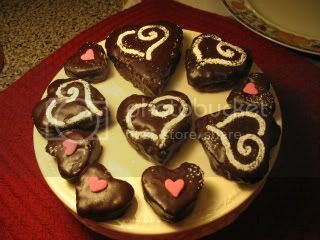 We'll be celebrating our anniversary on Valentine's Day, I know I will have something chocolate. I love that first table Kathleen. All your tables are great but that one is particularly lovely. The number has gone from 7 of us up to 10 and now maybe just 5 for dinner and the next day could be 7 or 8 (but I think we'll go out). I had run out quick to Homegoods to get some more of the Valentine plates I liked when the number was increased, now it seems like I don't need them after all. Kids! Thank you, Ladies, I appreciate your kind comments, even on re runs for some of you! I hope divine inspiration will enlighten me soon! I did 2 tables yesterday..got some Red British Castles plates and played with them..